After flying from Muscat, Oman I arrived at Ho Chi Minh City airport in the evening and had a tour operator pick us up at the airport for a minimal fee. Travel time from the airport to the hotel was about 30 minutes. Since this is a Category 4 hotel, I was able to use my annual free night certificate that I received from my Chase Hyatt Credit card for the first night. For the second night, I used points plus cash which came out to 7,500 points plus $100. Not bad considering the standard rate for two nights in a suite here goes for $1,100. Check-In procedures where fast since they walked me straight to the room once I arrived at the front desk. The hotel checked me in using a tablet as we were making our way to the room. Since I was a diamond member they upgraded me to a suite. This doesn’t happen often, so I very much appreciated this. 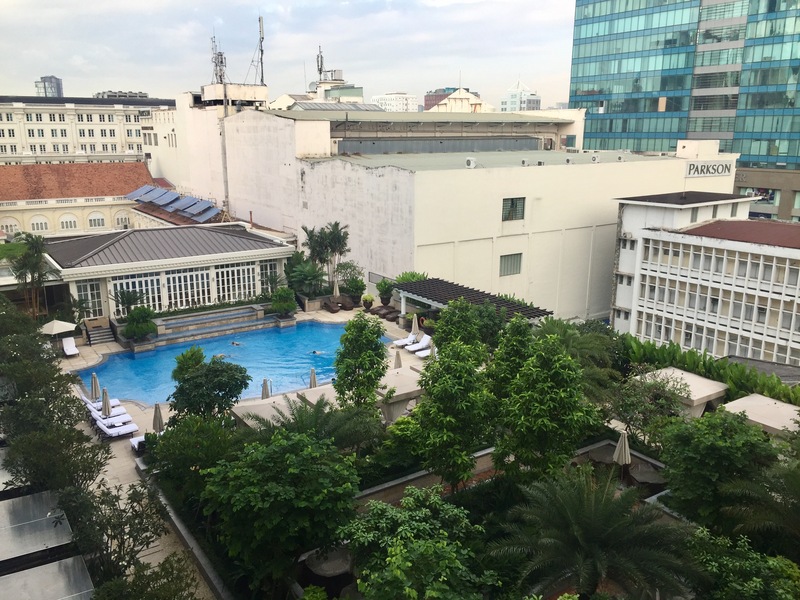 Park Hyatt Saigon is centrally located with many tourist attractions and restaurants within walking distance. During the first night, we walked around the city and had a great meal at a roof top bar. Also, all the tours we booked had no issue picking us up at the hotel entrance. The room was beautifully decorated with high quality french styled furniture that was in great condition. There were desks in both the living room and bedroom, along with a kitchenette, small dining room table, and a large walk-in closet. I was also impressed by all the real flowers placed in the room to add some color. The room felt more like a home than the typical bland hotel room with the same old furniture. There are many amazing places to eat in Vietnam, so I only had breakfast at the hotel. Breakfast had the typical spread of breads, meats, fruit, and eggs. However, I enjoyed starting the day with a tasty bowl of Pho soup and a baguette. For being in the middle of a very crowed city, the pool area on the roof is great place to relax and is decorated with a lot of greenery. Service at this hotel is top notch, well staffed, friendly, and ready to accommodate at a moments notice. During check-in, they asked the specific time I would be checking out. I wasn’t sure why they wanted to know this, but as I leaving my room for the last time there was a bellhop waiting in the hallway to take our luggage downstairs. I especially liked the complementary wine, fruit, and suite upgrade for being a diamond member. PreviousFinally Booked! Business Class With SriLankan Airlines To The Seychelles!